During their last year with the Marvel license, ToyBiz kicked things into overdrive, putting out a huge number of new figures at a truly daunting pace. We had four regular series of Marvel Legends, one store-exclusive series, two series of two-packs, three box sets, two series of Fantastic Four, three of X-Men and five of Spider-Man. That is, on average, one new series shipped to stores every two and a half weeks, not even counting Marvel Select and Superhero Showdown figures. Holy crap! For fans of good action figures, it was a very expensive year. And also very frustrating, when stores choked with product under-ordered something you wanted. If you're one of the 12 people who found Fantastic Four Classics Series 2, congratulations; the rest of us hate you. Created by Professor Gilbert, once an instructor of Reed Richards', and granted a sort of pseudo-life by the mad alchemist Diablo, the android Dragon Man is an unstoppable juggernaut of rage and fury! His great wings enable him to fly, his powerful tail strikes with the strength of a dozen bulldozers, and his fiery breath is as hot as a raging inferno! The only thing that distracts this simple man-brute from his rampage of destruction is his fascination with Sue Richards, the Invisible Woman! You read that right - Dragon Man is a robot, not a monster. Why'd the scientist build him this way? What is the benefit of a nine-foot-tall purple humanoid dragon? What was he going to use it for? It's not like we design crash test dummies to look like bigfoot or the Loch Ness monster. Something like this doesn't happen by accident - Professor Gilbert had to intend his robot to look like this. Bet there's always a rush for the students to get into his classes before they fill up, huh? "No lecture today, students - instead, go outside and spend the class period catching pixies." Dragon Man is posed with a bit of a hunch, but he still stands 7½" tall. If he could stand up straight, he'd probably have another 2" on that, but he's still one of the biggest Marvel figures around. Large figures like this always sacrifice a bit of articulation, but DM is still plenty mobile. He has hinged toes, ankles and knees, balljointed hips, a swivel waist, hinged fingers, wrists and elbows, balljointed shoulders, a balljointed head, and even a hinged jaw. His tail is bendy (though far too thick to really bend much) and swivels where it joints the body, and his wings are balljoints. Everything is nice and tight, to keep him standing well into the future - as long as you use his tail as a tripod. The sculpt on this guy is fantastic (no pun intended). His skin is a panoply of cracks, bumps, wrinkles and ridges. A usual, a larger canvas to work with means better detail. 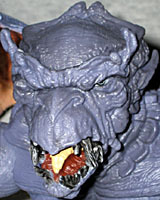 The wings are thick and veiny, and his tongue even has sculpted taste buds. His teeth and nails have the appropriate texture, and his little loin cloth looks cloth-like. And if you think it's weird that he's wearing a loin cloth, be glad you can't see what's behind it. His back is most impressive, with big plates giving way to smaller scales before reaching the spikes that flank his spine. Honestly, the closer you examine Dragon Man, the better he looks. Dragon Man is a Jack Kirby creation, but has been drawn a bunch of different ways over the years. 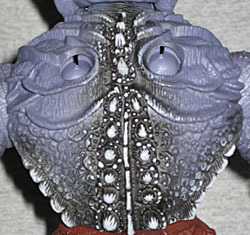 Most versions seem to share te large bulbous head, which has actually been toned down, slightly, for this figure. He's still rocking a huge cranium behind those big, spiked eyebrow ridges, it's just not as huge as it might be. It's like Sputnik: spherical, but quite pointy in parts. His beak protrudes nicely, and his eyes are deep-set. Very deep. This really is a frightening brute. Bonus points for not making him perfectly symmetrical, but instead throwing in some minor variations. Given his huge size, Dragon Man doesn't come with any accessories - they wouldn't have fit on the card! Heck, you already have to attach his wings and tail yourself. It really points out how silly all those fanboys complaints about Annihilus being too small were. 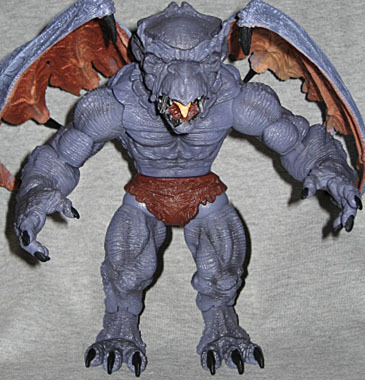 Dragon Man is already a blister-buster, and the first Hasbro Legends BAF is bigger. 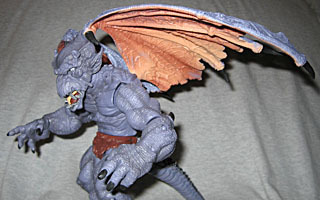 Dragon Man is a very nice figure, but most fans will never have the chance to own him. A poor character selection and even poorer casepack made FF Classics 1 a non-seller, so no stores ordered Series 2, despite the fact that it contained two must-have villains and three good variations of the main team. ToyBiz probably could have sold cases (or at least complete sets of five) directly to the fans, but FFC2 just got lost in the shuffle. 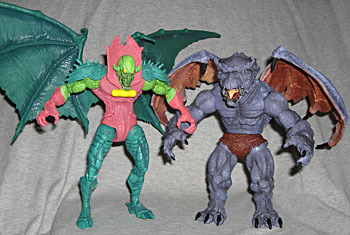 Given the way Hasbro seems to love re-using ToyBiz's molds, they really need to put Dragon Man in a box set with Kang and the Ultimate Fantastic Four toys and either sell it through thir site or make it a store exclusive. No new parts, no new paint apps, just put these damn toys in the hands of the fans who want them.